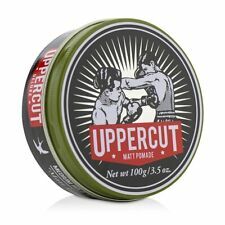 Uppercut Deluxe. Matt Pomade 100g. Creates a no-shine matte look. Perfect for all hair types & length. Blow dry and style as desired. TEXTURE: Moderate. Expiration Date: 9/2019 or later. Lockhart's Fire and Brimstone is a devilish blend of oils and waxes made specifically for the Halloween season. Red as the fires of Hell in the spirit of the Halloween season. LOCKHART'S Fire & Brimstone Limited Edition Hair Pomade 4Oz. Creating and defining texture has never been easier with Monarch Matte Paste. A versatile product for any style - Quiff or Slick Back. Polysorbate 20, Fragrance/Parfum, Phenoxyethanol, Glycerin, Macrocystis Pyrifera (Kelp) Extract, Potassium Sorbate. Outstanding performance across a diverse range of styles and hair types. Size – 100g. Finish – No shine natural matt look. Gives reworkable hold with a matt finish that lasts longer. Lynx Natural Styling Clay. Scoop a finger full of clay and rub between your hands. Prospectors Gold Rush Firm Hold Water Based Pomade. Premium Pomade. Conditions and softens dry hair and scalp with hemp oil. Clean Floral Scent. - Release dates for Pre-Order Sales are subject to change due to manufacturer delays. Comb or brush into place. Perfect for slicked back or rough textured & high shine styles. Apply to towel-dried hair. Ideal for curly or straight hair. - Over 15,000 authentic products. Helena Rubinstein. IDA Faddy Sea Salt Spray 190ml x1. For tousled, volumized hair with matte finish. Also can emphasize strands or twists. Finger comb. Spray on dry or damp hair. Allow it to air dry. Schwarzkopf OSiS Dust It - Mattifying Powder lets you creative styles with powder consistency while providing a lightweight texture and separation. 3 Bottles of SCHWARZKOPF OSIS DUST IT MATTIFYING POWDER Ordered . Easy to use styling cream works well for all hair types. Forming Cream provides hold, excellent pliability, and a natural shine. Power paste for moulding & texturising. CREATIVE TEXTURE. - Add texture & roughed up style. - Mouldable paste for sculpting unstructured, natural looks. - Powerful & mouldable paste. - For all types of hair textures. X2 Schwarzkopf OSiS FLEXWAX Cream hair texture Clay Wax 85ml. JOICO 08 MATTE CLAY HAIR STYLE REFORM 100ml. This price is for two (100ml x2). X2 50ml ALFAPARF Semi Di Lino Cristalli Liquidi Illuminating Serum Hair Oil. To use: Apply the foam to hand palms & distribute evenly throughout damp or dry hair. Makes your hair look thicker & fuller with a natural shine. TIGI Dumb Blonde Reconstructor Conditioner 200ml (For Chemically Treated Hair). It has carnauba wax, from the Brazilian palm tree, providing you with flexible hold. Your hair will stay smooth and silky whatever the weather as this water-soluble wax fights against humidity and frizziness. (如果是寄送到中国的订单，请提供您的中文名称和地址，以及您的电话号码。). - Over 15,000 authentic products. To use: Apply liberally to wet hair & mold hair & brush through once. Gives an ultra-matte finish. Shields hair against the harmful effects of UV rays. Keune Design Line Straight Cream Non-chemical hair straightener, creates soft and smooth hair until the next shampoo. Apply the Cream to towel dried hair and comb through. Either blow-dry or iron your hair straight. Hair Care by Schwarzkopf. Gives a high shine finish. To use: Apply to dry hair & shape into desired look. Provides weightless texture & strong hold grip. - Over 15,000 authentic products. Helena Rubinstein. TIGI Catwalk Curls Rock Amplifier 5.07 oz. TIGI Bed Head Wax Stick 75g. TIGI Bed Head Colour Goddess Oil Infused Shampoo for Coloured Hair 400ml. TIGI Bed Head Colour Goddess Oil Infused Conditioner 200ml (For Coloured Hair).